Blackberry Cobbler Pies with Cookie Dough Crust are an easy dessert made from 6 staple ingredients in individual ramekins, facilitating portion control. They are so quick to assemble and delicious that you will want to make them all year round. Summer is not only a top vacation season but also a great time of the year for enjoying many entertaining events such as cookouts, get-togethers, and birthday parties. 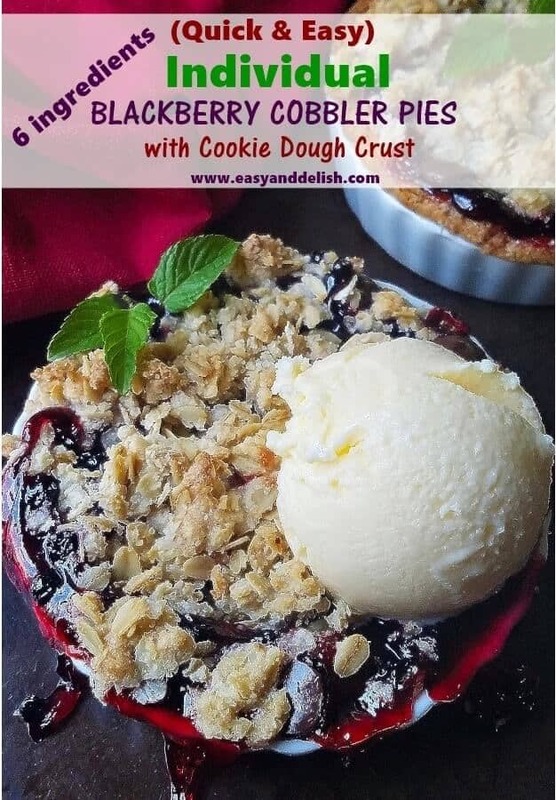 As a busy mom, I give preference to easy-to-put-together dishes and treats such as these individual blackberry cobbler pies with cookie dough crust. Believe me, they are made from only 6 ingredients and are quite quick to assemble, saving me time in the kitchen. Basically, the oven takes care of this treat by itself… all without stretching the waistline and getting in the way of bikini season! Important, right? Excited? So let’s make them! Preheat oven to 350 degrees F. Lightly grease 4 (4 1/2-inch) ramekins and set aside. Next, divide the store-bough chilled chocolate chip cookie dough equally, distributing in the bottom and sides of each greased ramekin. Using a fork, prick the bottom of the cookie dough, place ramekins on a baking sheet, and bake for about 5-7 minutes. Remove from the oven and let cool a little bit. Meanwhile, prepare the topping by mixing by hand oats, flour, butter, and sugar in a bowl until texture is coarsely clumpy and mixture will hold together in clumps when you squeeze it with your hand. Last, mix canned berry filling with lemon juice if desired, distribute filling among the ramekins and top with the crisp/crumble. 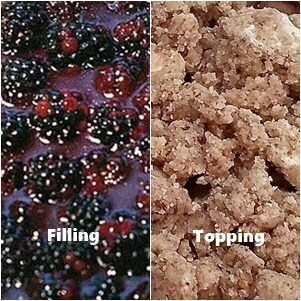 Bake for about 18-25 minutes or until berry filling is bubbly and the crisp topping is lightly brown. Enjoy while warm, topped with a (low fat) ice cream or frozen yogurt. Preheat oven to 375 degrees F. Lightly grease 4 (4 1/2-inch) ramekins and set aside. Next, divide the store-bought chilled chocolate chip cookie dough equally, distributing along the bottom and sides of each greased ramekin. Using a fork, prick the bottom of the cookie dough, place ramekins on a baking sheet, and bake for about 5-7 minutes. Remove from the oven and let cool for 3 minutes. Meanwhile, mix canned blackberry pie filling and lemon juice (if desired) and distribute among the ramekins. Prepare the topping by mixing by hand oats, flour, butter, and sugar in a bowl until texture is coarsely clumpy and mixture will hold together in clumps when you squeeze it with your hand. 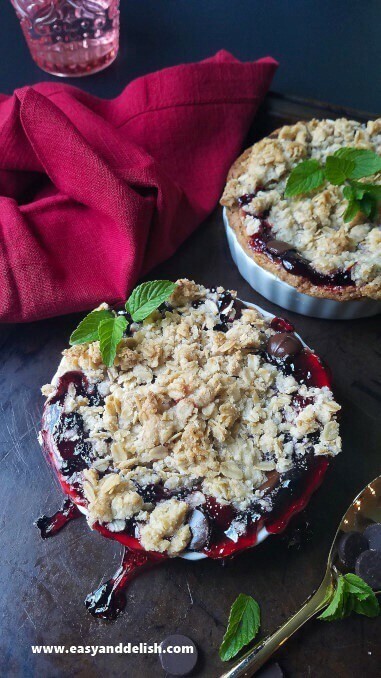 Top berry filling with the crisp/crumble. 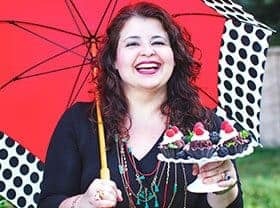 Bake for about 18-25 minutes or until berry filling is bubbly and the crisp topping is lightly golden brown. Enjoy while warm either by itself or topped with a scoop of (low fat) vanilla ice cream or frozen yogurt. Baking time varies from oven to oven. Let baked cookie dough cool for at least 3 minutes before spooning in the filling to help prevent it from becoming soggy. Any leftovers should be covered and refrigerated for up to 2-3 days. Looking for quick and easy individual summer desserts? Try our Raspberry Pistachio Froyo Pies. 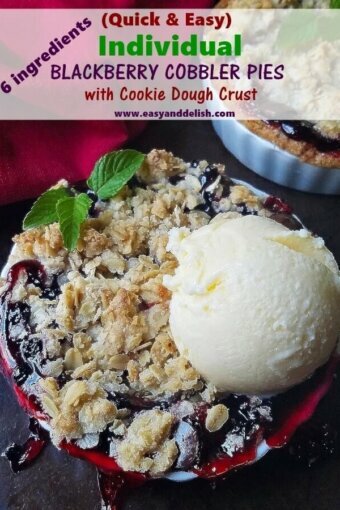 I’d have to splurge and use fresh, local blackberries but that cookie dough topping is pure summer magic! Wow! That sounds really good, I love that you used cookies as a crust. Fabulous, Denise!! I LOVE berry season! And this looks berry good. 🙂 Thanks! This looks like something I would enjoy making! It looks simple to me. Those ingredients don’t seem so difficult to find. And it looks delicious!! The topped ice cream is a must! Thank you! I hope you try it and enjoy. A fave at my household.